But my new favorite "unusual" flavor combination? Now many of you reading this might be saying, "Chicken and waffles? That's not unusual. That's as common as turkey with stuffing." Well you might be right, but I've still told enough people about my love for chicken and waffles the past couple of months who have turned to me and said, "Chicken and waffles? Really? That's actually good?" And do you know what my response is? "OMG! IT'S DELICIOUS!!!! It's even better than chicken and mashed potatoes!" So here's the skinny on chicken and waffles. This past summer my husband and I visited New York City. While there, I wanted to go to Harlem and visit a real soul food restaurant. We stumbled upon Amy Ruth's on 116th St. and our taste buds have been thanking us ever since. Upon perusing the menu, the first thing you notice is that all of the dishes are named after distinguished African Americans, the most famous dish being the Rev. Al Sharpton which is, of course, chicken and waffles. My new favorite flavor combination. Thank you Amy Ruth's! Now the chicken and waffles were absolutely brilliant and delicious separately (it was probably the best fried chicken I've ever had! ), but something happens when you pair the crisp, juicy chicken with the light, airy waffles. Michael Symon always talks about the need for balance in a dish and so the reason I am asserting that waffles are a better pairing for fried chicken than mashed potatoes is because both fried chicken and mashed potatoes are rich and heavy, whereas the lightness of the waffles and sweetness of the maple syrup help balance out the heavy, savory fried chicken. 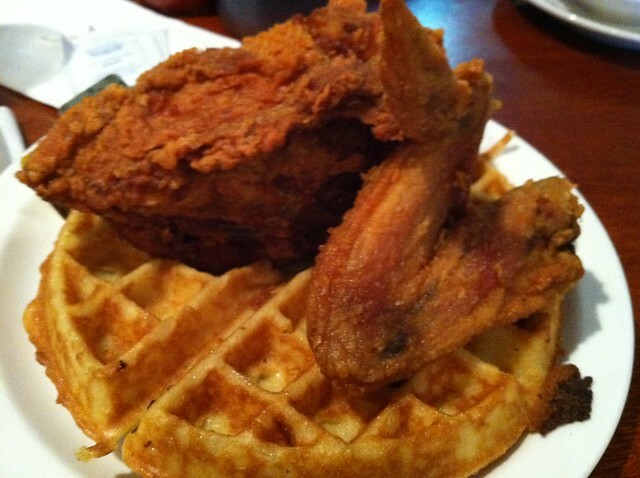 So ever since that moment at Amy Ruth's back in July, I have been craving chicken and waffles. Luckily, Zingerman's Roadhouse in Ann Arbor will indulge my craving, even when they're not on the menu (when we're there for breakfast anyway. I haven't tried asking them to make it for me during dinner service). I mean they have the chicken. They have the waffles. Why can't they do both on one dish? They do and they will! So now whenever I have a hankering for chicken and waffles, I only have to drive 20 minutes down I-94 instead of flying back to Harlem or somewhere down south. And if you've never tried chicken and waffles before, I implore you to give it a try. Your taste buds will be thanking you just like mine did. Oh my gosh, this sounds delicious. I was planning on fish tonight, but now I'm not so sure! An odd combination, but it actually sounds delicious! I'm adding Amy Ruth's to my NYC list. I've never imagined chicken and waffles -- but I accept your argument and experience! I've heard of this combo but not quite sure I want sweet with chicken. On the other hand, your enthusiasm has me curious. Oh yes, this combo seems to be taking over, one brunch place at a time! My favorite restaurant here in DC calls it the 'Angry Bird.' Love it! I love chicken & waffles. If you come out to Cali, definitely go to Roscoes. It's known for chicken and waffles and the other food is good as well.